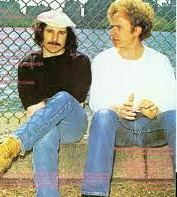 Say the names Simon and Garfunkel and see what it evokes. Steve from South Caroline wrote the other day that he was listening to their early work and within seconds PilotPatty from the Metrowest area of Massachusetts laid down four lines of a classic S&G song bam!, just like that right out of her head. Music goes deep all right. The mere mention of their names takes me back to senior year in high school when late at night I worked away up in the attic, making two velvet dresses for my sister and me while “The Sounds of Silence” played on the radio. The dresses were Burgundy and Forest Green I remember and they bunched in a sad homemade way around the armpits so later that winter I added long sleeves in the belling-out angel-costume fashion of the times. Don’t mind showing my age and generation by still playing all of the old S and G sounds. The “For Emily…” song was a great favorite. Every student after that with the name Emily reminded me of that song. Simon went on to what he considered “a better place.” Art continued to make beautiful music, if not as popular. If you ever have the chance, listen to Garfunkle’s “Second Avenue”. Truly…the song remembers when! It was the poetry and the harmony, obviously. Was it them or that moment in our lives? My brother Jim and I will be happily performing some of their tunes this coming month at a place called “Owen and Ollie’s” in Dracut on a Sunday afternoon/evenig. To this day, out of all the S & G songs we sing together, “The Boxer” is our absolute favorite! you must tell us the details! you guys are very good I happen to know !